India Post Jharkhand Postal Circle had conducted written examination for Postman, MTS, MG posts. The written exam was held on 10 April 2016.Earlier India Post Jharkhand had invited applications for 199 Postman, Mail Guard and Multitasking Staff (MTS) posts. Now the result of Jharkhand Postal Circle Postman exam are under preparation and going to be declared after preparation. Candidates can check Jharkhand Postal Circle Postman Exam Result from the direct link given below. After the results got prepared, JPO / JPC will upload the merit list having roll no. of qualified candidates in its official website ranchipost.asrb2014.org. We are constantly in touch and going to update you with latest news on this. Cut off marks will be decided by JPC and the merit list will be prepared on this basis of these. 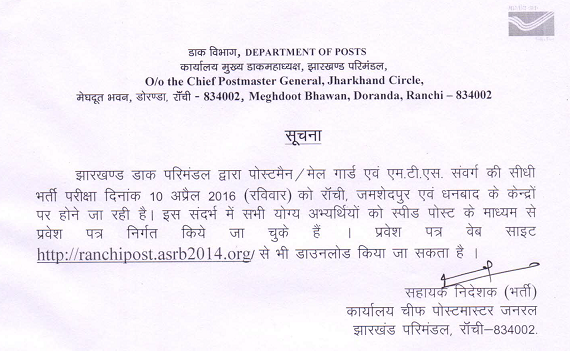 Department of Posts, India or India Post Jharkhand Circle is going to conduct written exam for Postman, MTS, Mail Guard posts on 10.04.2016. It will be held at Ranchi, Jamshedpur and Dhanbad district centres. Admit cards had been uploaded at the official website ranchipost.asrb2014.org. You can download Jharkhand Postal Circle admit card from the official website via the direct link given below. All the important details like reporting time, roll no. exam venue address, date and time etc. had been mentioned in the hall ticket. Admit cards had been dispatched via post. Also they are available now for download online. The written examination consists of multiple choice objective type. 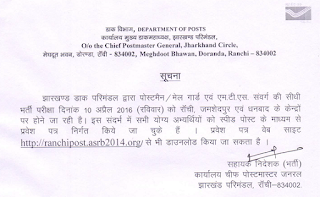 The candidates can download their admit card from Jharkhand Postal Circle website ranchipost.asrb2014.org from here. You can download the admit card for India Post Jharkhand Postman exam by visiting the direct link provided here. It will take you directly to download page. Then candidates need to enter their name and select the date of birth and click on login. Their Jharkhand Postal Circle Admit card 2016 will be displayed after entering these details.